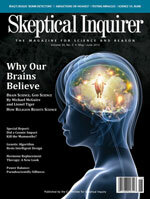 The May/June edition of the Skeptical Inquirer had on its cover an artist’s rendition of the human brain embedded with an image resembling either God or Jesus (take your pick) along with the caption “Why Our Brains Believe”. The feature article “Brain Science, God Science; Why Religion Endures” was written by two really bright guys , Michael McGuire and Lionel Tiger. Dr. McGuire was formerly a professor of psychiatry and biobehavorial sciences at UCLA and author of ten books including Darwinian Psychiatry. Currently he is president of the Biomedical Research Foundation and a director of the Bradshaw Foundation. Lionel Tiger is the Charles Darwin Professor of Anthropology at Rutgers University. He is a best selling author and has written articles for magazines as diverse as Rolling Stone and the WSJ. Very well. But for me that is where their logic jumps the track. First, if their claim that a god or some equivalent is a product of the normal human brain, then an equal claim could be made that some 20% or 61 million brains in the U.S. (including mine) are in some way abnormal. Furthermore, in Denmark some 80% of their population of 5,155,575 or 4,124,460 hapless victims would find themselves shackled with abnormal brains, while Sweden with a population of 9,074,055 would suffer a similar fate with 7,259,244 of their brains downgraded to the abnormal category. Parenthetically, it should be noted that even with the burden of all those abnormal brains, Denmark and Swed en scored amongst the highest in the Economist’s Quality of Life Index as to the “best” places to live in the world. The index takes into account factors such as income, health, freedom, unemployment, family life, climate, political stability, life satisfaction and gender equality. In fact, it turns out that the top twenty nations with the best quality of life whose citizens by a wide margin, are non-religious, possess a far greater percentage of abnormal brains. The article’s authors defend their argument by claiming “The human brain has evolved to act, not to think.” If true, one has to wonder how we came by the telephone, radio, TV, internet, heavier than air flying machines, smart phones, heart surgery, organ replacement, the Hubble Space Telescope and thousands of other inventions and medical procedures in the last two hundred years. This is equivalent to just one tenth of one percent of the time since we evolved to our present brain size some 200,000 years ago. Indeed, since most of those discoveries were made in just the last 50 years, it seems to me there is some hope we have attained cut-off velocity in our race to escape the gravity of ignorance. When the authors ask why a god or some equivalent is a product of the human brain, I think the “simple answer” they provide; that “it is almost a neurological secretion“, has an even simpler answer . In my view, the Occam’s razor answer is that all the religious nonsense held by “believers” was introduced into their brains as youngsters by their parents before they developed the proper critical thinking skills. The human brain does not become fully developed until the early 20’s. Once an idea is implanted in an immature brain, it becomes nigh impossible to dislodge when the brain is fully developed. (See my blog on hoop snakes) Meanwhile they will in turn pass on their lack of critical thinking skills to their children. How else can we explain that Alabama is populated by Baptists while Indonesia, Saudi Arabia and Iran are populated by Muslims and India is populated by Hindus? As Richard Dawkins has pointed out, “Anyone raised a Baptist in Alabama, knowing full well that if they were raised in Saudi Arabia they would have been a Muslim, knows what it is like to be the victim of childhood indoctrination. Memes are not transmitted by ” almost”neurological secretions. They are transmitted by words. Although the idea is so unethical, I am loathe to even mention it, there is a simple way to test my argument. Just switch the newborn babies of three mothers; a devout Muslim, a devout Baptist and an atheist without the mother’s knowledge. In a mere 20 years we would have our answer. Finally, in the quest to find answers, it might be helpful if scientists studied the abnormal brains of individuals like myself. Just maybe they would stumble on the answer as to why Denmark and Sweden rank at the top of educated, peaceful and happy nations while the most religious nations (including ours) rank at the bottom. Perhaps their abnormal brains are also responsible for countries like Denmark and Sweden being the most generous in aid to other countries. I havent read the article, but the below podcast discussion between DJ Grothe and Lionel Tiger is very interesting and makes me want to read the book. They disucss interesting ideas such as the transition from hunter-gatherer to agricultural societies prompting establishment of religious/moral systems to control the larger populations.